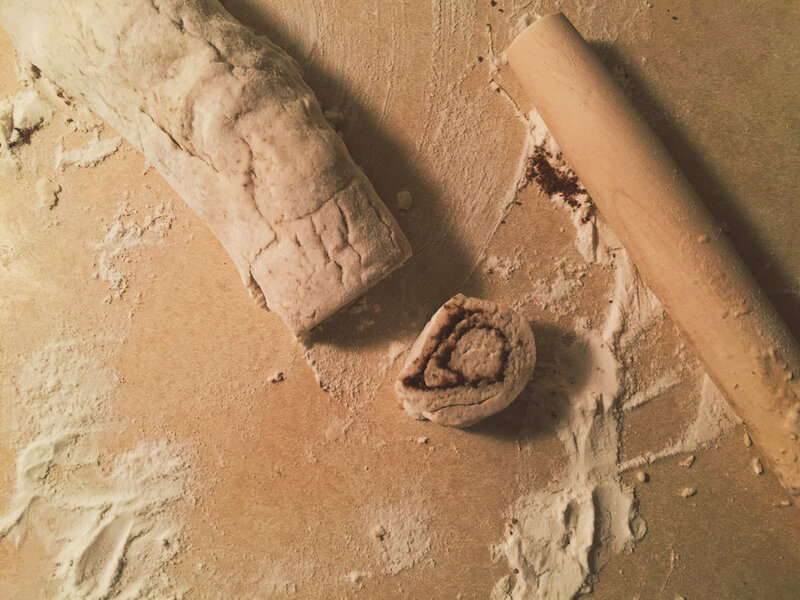 It's not the holidays in our household unless we're having cinnamon rolls. Our first year of marriage, I learned how to make these super easy, super yummy, super vegan cinnamon rolls to celebrate the holidays! Today, I'm sharing my super special recipe with you! Traditions are interesting, aren't they? Every year, we make a choice to keep them or leave them, in pursuit of our own new way of doing things. This year, we have been encouraged by wise people in our life to grow our marriage by starting new traditions, by finding what works and what feels right and going after those things. My whole life, we woke up early on Thanksgiving morning to the smell of warm cinnamon rolls in the oven and the sound of the Macy's Thanksgiving Day Parade on the TV. My siblings and I would all pile on the sofa and we would marvel at our favorite cartoon characters becoming larger than life in a parade balloon. When we first got married, I began to miss this tradition. I missed my siblings, I missed my mom's cooking and Brandon isn't super into watching the parade. I decided to try to make our first Thanksgiving morning a little bit more homey by making my own cinnamon rolls to carry on that tradition while making our own. Our first year of marriage, I wasn't much of a cook so I was so happy when I took these out of the oven and Brandon loved them (who wasn't gluten-free or vegan at the time!) Ever since then, it has been a tradition that we have to have cinnamon rolls on Thanksgiving morning. Heat the oven to 425 degrees. Spray a 9 inch round cake pan or casserole dish with cooking spray. In a small bowl, mix brown sugar and cinnamon and set aside. In a large bowl, stir the Bisquick, sugar, almond milk and flax egg together until dough forms. 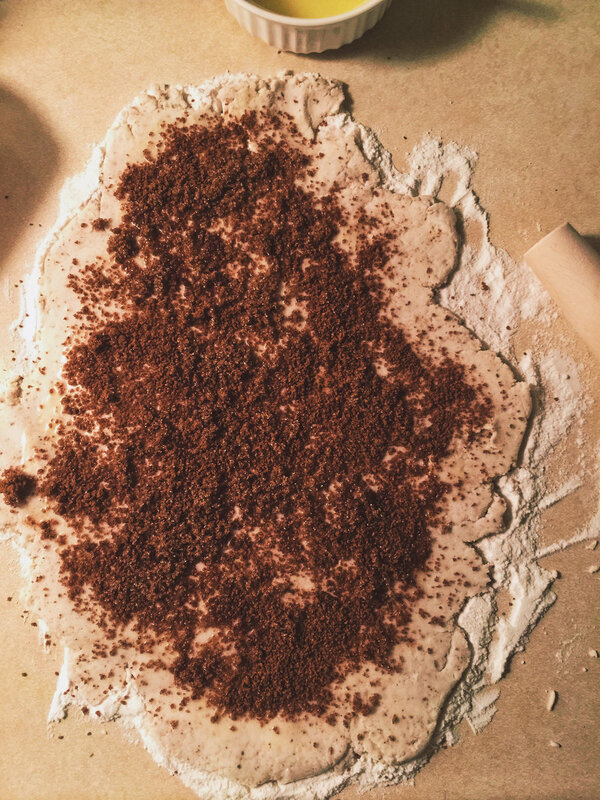 Use more or less almond milk until it makes a dough consistency. Sprinkle the surface with extra Bisquick mix. 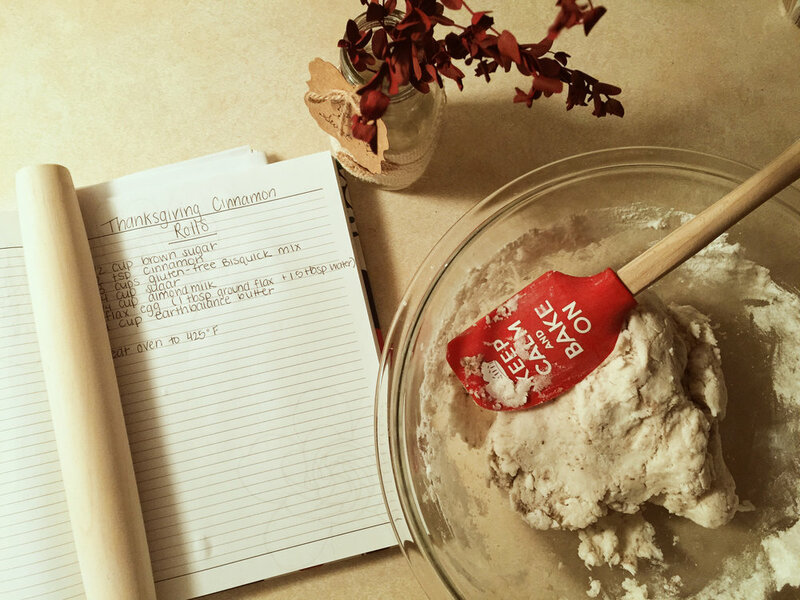 Place the dough on the surface. Knead a few times. Brush with 2 TBSP melted butter. Sprinkle evenly with brown sugar and cinnamon mixture. Starting at the short side, roll it up tightly. Cut into 1.5 inch slices and place into the pan. Optional: Brush with extra melted butter on top. While baking, combine all the icing ingredients in a bowl and mix until smooth with a hand mixer. Let the cinnamon rolls cool for 10 to 15 minutes before slathering on the icing! Enjoy!